Jay Rounds, project chair, with assistance from fellow Rotarian, Harlan Radford, stamped each dictionary with the Rotary logo and a place for the student’s name. The following Rotarians visited the schools for interaction with both students and teachers as the dictionaries were distributed: Mark Bacon, Matt Daugherty, Lynn Donaldson, Jon Fancher, George Frank, Pam Gallagher, Chuck Gustafson, Jim Harris, Harlan Radford, Jay and Jean Rounds, and Michael Shoaf. Members were rewarded with smiles on the students’ faces as they received their dictionaries and began to explore the contents. Both students and teachers are very appreciative in receiving these dictionaries and utilize them in the curriculum. 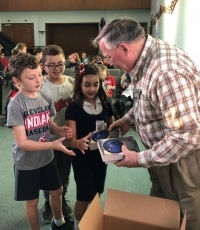 A teacher shared that when asked to share something special with the class, one student brought in his sister’s dictionary and said that he was excited to now be receiving his very own.